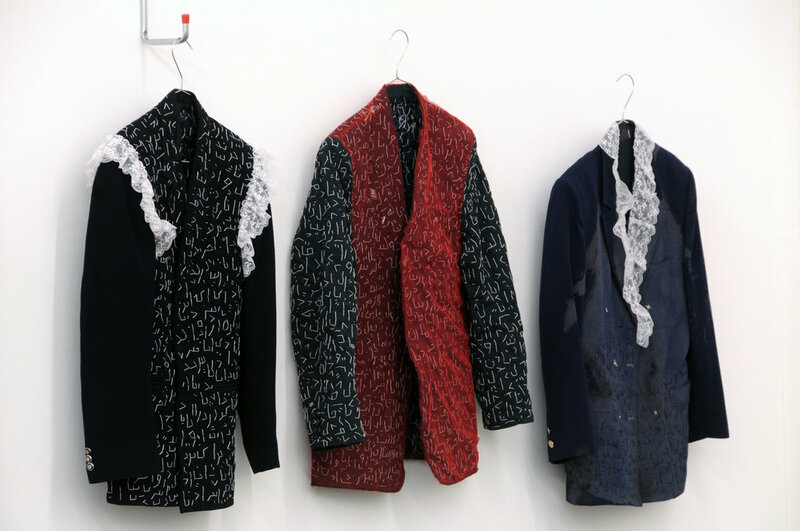 "Fate" is an installation consisting of 12 pieces of used male coats I gathered over a course of time while I was working in the Women's right organization in Iran. I used sewing on the coats as a process of reformation and obstruction at the same time. I treated them as the starting material providing me with their memories and the identity of their previous owner. By adding different pieces of used and found fabrics and cutting the some other parts, the coats started to lose their functionality and reveal their vulnerability. I used embroidery on the coats with black and white threats, and covered the external layer with stories in Farsi calligraphy. Mainly fictions, the stories sewn on the coats were based upon the unknown characters from my memories and my experiences as a female body.